1. 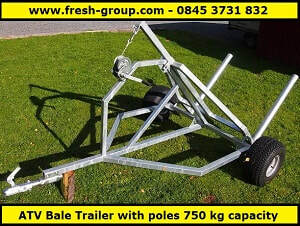 Video of the Chapman ATV bale trailer. 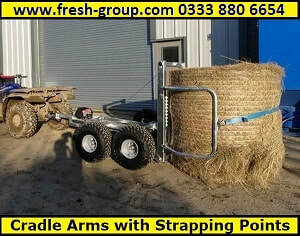 A unique feature of this ATV bale trailer is the wraparound arms that clasp the bale tighter as you reverse into the bale, then you simply secure the bale to the trailer using a conventional ratchet strap. 2. 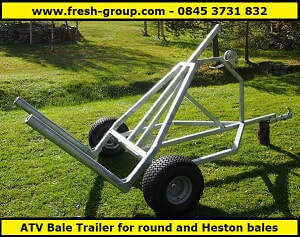 ATV bale trailer video. 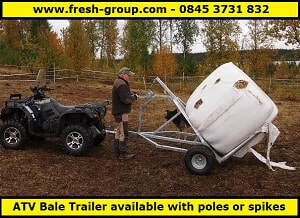 Due to its wide, low ground impact tyres fitted to the bale trailer, damage to your fields is minimal. 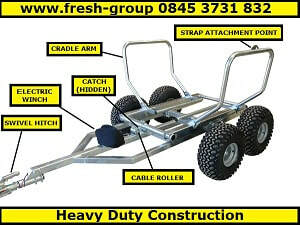 This ATV bale trailer, when fitted with standard poles will transport round bales with a maximum weight of 750 kilograms.